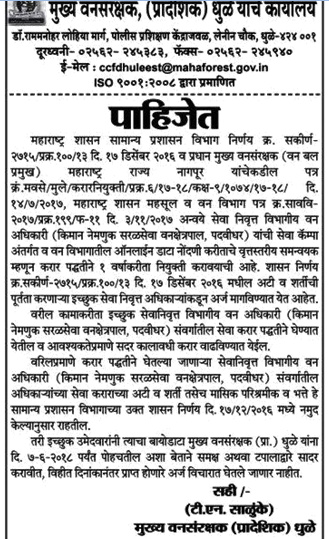 Dhule Van Vibhag (Forest Department Dhule), Dhule Published Job Notification for Online Data Entry Operator Posts. Candidates who wish to apply must look at Dhule Van Vibhag Online Data Entry Operator Recruitment 2018. Eligible candidates can apply Offline before 07-06-2018. Interested & Eligible candidates can send their application along with all the necessary documents and testimonials to मुख्य संरक्षक, धुळे यांचे कार्यालय, राममनोहर लोहिया मार्ग, प्रशिक्षण केंद्राजवळ, लेनिन चौक, धुळे-४२४००१. Starting Date, Last Date to Apply Offline at Forest Department Dhule which candidates should be remembers as follows. Start Date to Apply Offline: 01-06-2018. Last Date to Apply Offline: 07-06-2018.